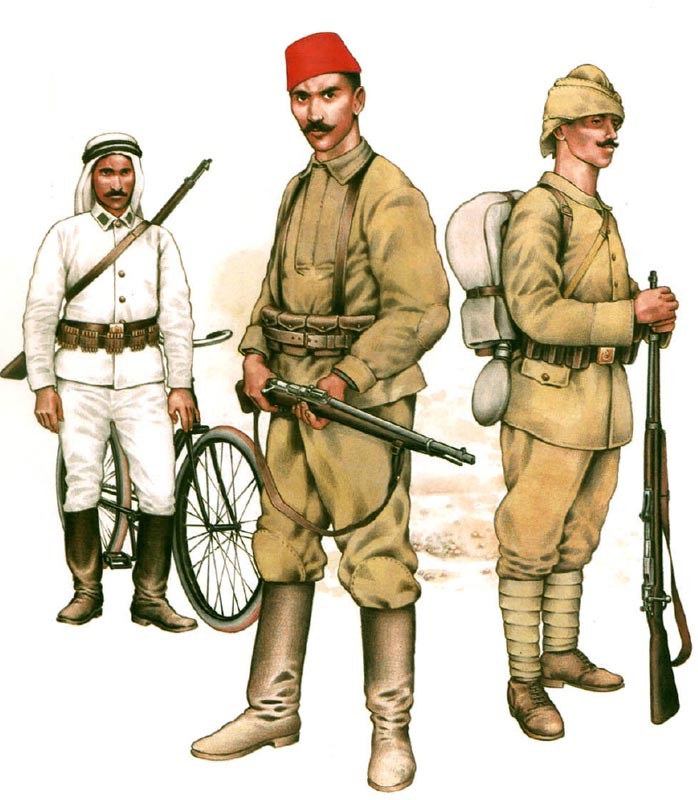 Infantry of Ottoman Army, from left to right: Arab bicycle soldier (1915), Infantryman on Russian front (1917), Turkish line infantryman (1914). 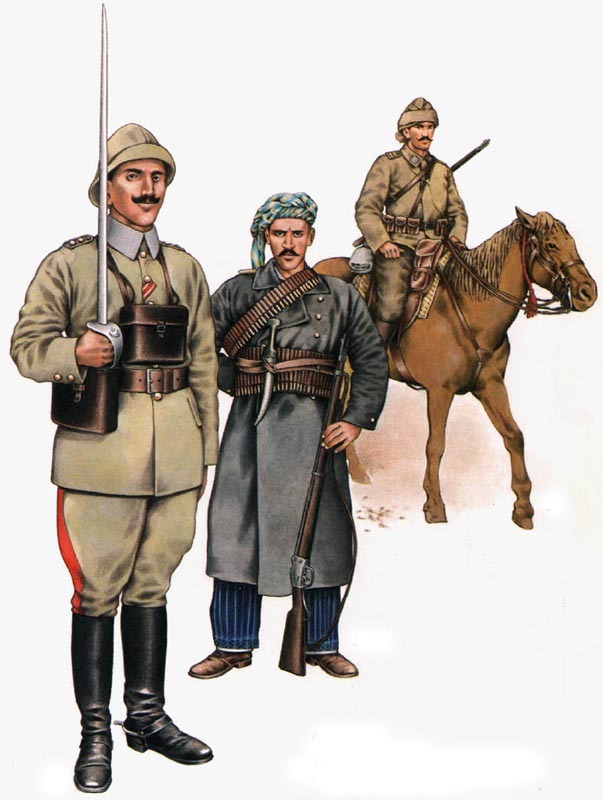 The Ottoman Army in World War One – uniforms, strength, organization. At the start of November 1914 Ottoman Empire joined World War One versus the Allies. The ramshackle Ottoman empire ended up eroding for 50 years once, during 1908, the modern Young Turks Committee had taken power, removing Sultan Abdul Hamid along with surprising simplicity. More defeats had then followed: in 1911 by Italy in Tripoli, as well as in 1912 in the First Balkan War. Even though Turks got back certain terrain during the 2nd Balkan War, the army, exhausted by 6 years’ struggling, was at that time near to break, usually starving as well as in rags, its pay off within debt, its adminis­tration destroyed. Consequently a powerful German military mission had been on the job, ener­getically coordinating and exercising. The Turks were aware, at least, the truths of warfare, and within the Turkish units – several of the divisions were Arab and resented Turkish dominance – generally there was an intense, resent­ful, wolf-like self-confidence, which would on the battleground generate Turkish troops as stub­born as well as harsh soldiers as any on the planet. Blocked by Bulgaria, however neutral, from her northern allies, Turkey could acquire from them the much-needed army sup­plies simply by subterfuge. Inside her own areas, the brand new railway becoming constructed by German specialists yet had gaps each side of the Gulf of Alexandretta, when it surpassed the Taurus and Amanus mountains approaching to Aleppo. There it extended one of the ways in direction of Baghdad, but ended 380 miles next to the river Tigris, and yet another to­wards Amman and Medina. It was 250 miles away from the Russian Caucasus frontier from its closest place. The military, something over one million men strong divided in Thirty-six ordinary divisions, was allocated within the I, II, III, and IV Armies, which were correspondingly within Tur­key-in-Europe, western Anatolia, Erzurum close to the Russian border, and Syria. Additionally there were 2 ordinary divisions each in the Yemen, central Arabia, and Mesopotamia (modern-day Iraq). Enver Pasha, minister for war, who with Talat Bey, minister for the interior, headed the government, had taken control of the III Army, about 150,000 strong, and in mid­-December directed their ill-equipped men over the mountains into the Caucasus, versus the tinier Russian 7th Army. Surpassed by winter snow storms, the moment of the appearance of the 3 corps was wasted, and they assaulted piecemeal. However the starving, fatigued soldiers fought fiercely, and the Russian leaders were alarmed. After that, beaten close to Sarikamish, the Turks encountered the option of surrender or re­treat over the frozen mountains. Just 12,000 returned to Erzurum. One whole corps laid down its arms, and the Russians counted 30,000 frozen corpses in the wilderness. In Feb 1915 the IV Army sent 20,000 men along the Sinai peninsula to cut off the Suez Canal. Egypt, nevertheless in 1914 nominally a part of the Ottoman empire but since 1882 mastered and occupied by The United Kingdom, ended up announced an english pro­tectorate once Ottoman empire joined world war one. It had been garrisoned by a single British Terri­torial and 2 Indian divisions, and the two-division ANZAC Army Corps was setting up and exercising there. The Turks were beaten back easily. Within the years to come, the English considered the strike throughout Sinai, in the beginning clumsily and tentatively, after that in 1917 placed under Allenby skillfully and overwhelm­ingly, conquering Jerusalem in December 1917. Ottoman cavalry, from left to right: officer, NCO of a Turkish cavalry regiment, Kurdish irregular officer. Further east the English took the initia­tive early on versus the Turks. A brigade from India arrived at the head of the Persian Gulf in October 1914, followed by the remainder of a division created to defend the Anglo-Persian oilfields avoiding enemy incursions into the Indian Ocean. It rapidly conquest Basra and advanced far up the river Euphrates. Probably the most essential Turkish con­tribution towards the Austro-German war effort was, however, the instant one, done in October 1914 by closing the Dardanelles and Bosphorus to Allied ships. This kind of, simply by cutting off Russia’s Black Sea ports, brought her superb corn exporting business to an end, and closing her most crucial access for products from the outside globe. With a strike her exports dropped by 98 % as well as her imports by 95 %, numbers devastating to any country, probably be deadly to Russia with her great population and useless industry. It required impressive strategic and moral requirements on her Allies to come to her aid.